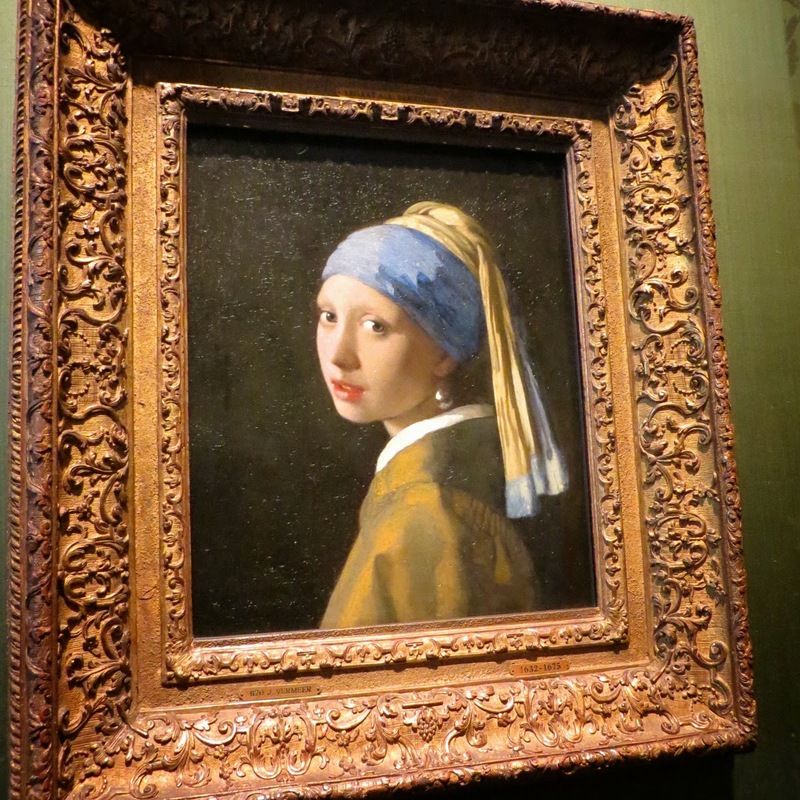 The Travelin' Lundburys: FRIDAY IN THE HAGUE--IT'S A MUSEUM DAY! I got a good night's sleep last night, I think I've finally recovered from the jet lag. The bed in our apartment is soooo comfortable--wish I could take it home with us! We didn't get a real early start this morning, it was almost 10:30 when we left the apartment. We walked to the Central Station and bought train tickets to Den Haag (The Hague). We lucked out--there was a train leaving in 5 minutes, so we hustled to the platform and hopped right on board. 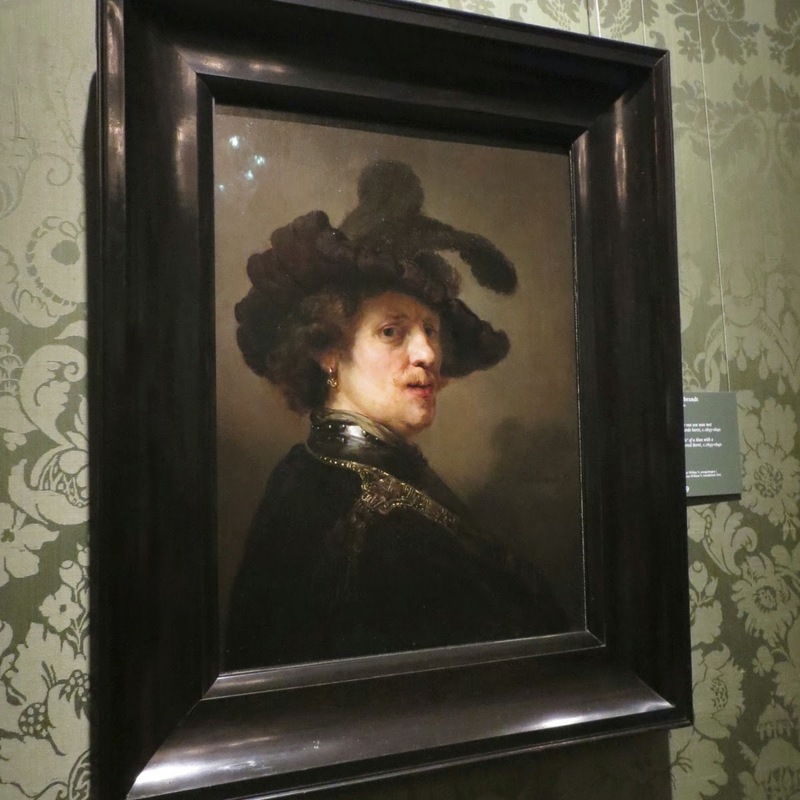 We planned to visit two museums in The Hague--the MC Escher Museum and the Mauritshuis. It was a 45 minute ride through the pretty Dutch countryside to Den Haag. We passed miles of beautiful tulip fields near Leiden. They are in full bloom right now, the colors are just brilliant. Our train pulled into Den Haag about 11:45. We decided to visit the Escher Museum first, and I had used my handy-dandy Netherlands Transport Ap on my phone to map out our route from the station. We easily found the tram stop right outside of the station, and soon our tram pulled up. We boarded and paid the driver for our tickets. Off we went--we rode around the corner and down less than 1/2 block to the first stop. That was our stop! We hadn't even sat down yet! Feeling ridiculously embarrassed, we hopped off. We had paid almost $5 to ride the tram less than a block! I'm sure the driver is still laughing about those dumb tourists that pay to ride 1/2 a block. Lesson Learned: Always check the actual distance traveled, not just the number of stops! We did have a good laugh at ourselves, though. 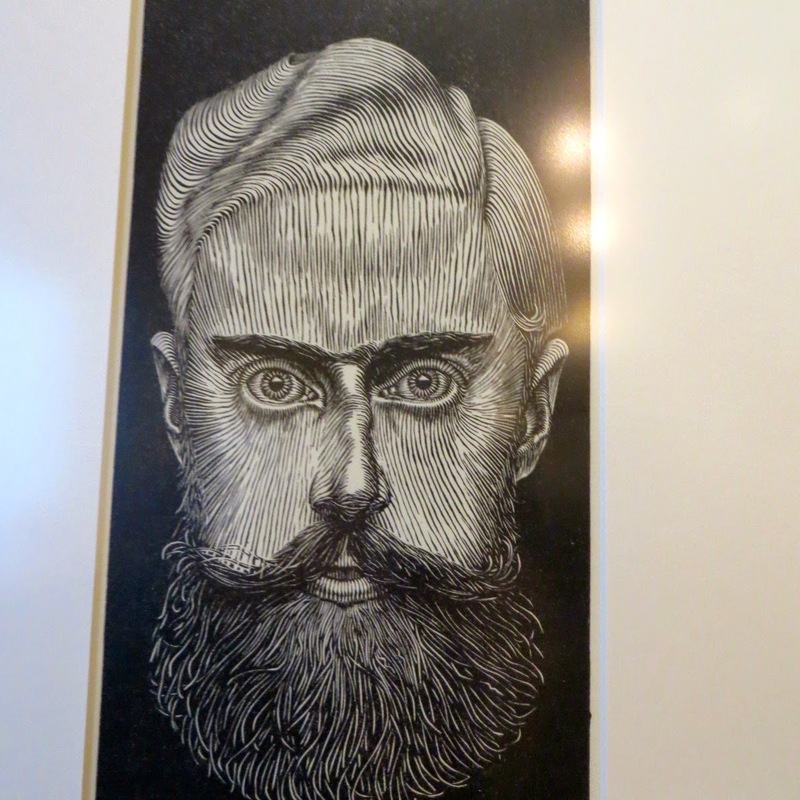 The MC Escher Museum is housed in the Lange Voorhout Palace, a former royal residence dating to the 1700's. Queen Emma used it as her winter home until she died in 1934. We paid our small admission fee of only 7.50 each--what a bargain. We were in for a treat! Escher's work is displayed in the first two floors of the palace, and the third floor is used as an "Optical Illusion" display. Each piece of work is nicely labeled, and there are many informational plaques explaining the ideas and concepts behind his work. It was fascinating, and we enjoyed every piece. Here are just a few of our favorites, there were too many to count! I liked these two self portraits. These next two were especially interesting to us because we've been to both places. This is St. Peter's at the Vatican--what an amazing perspective! I really liked these two nature inspired pieces. 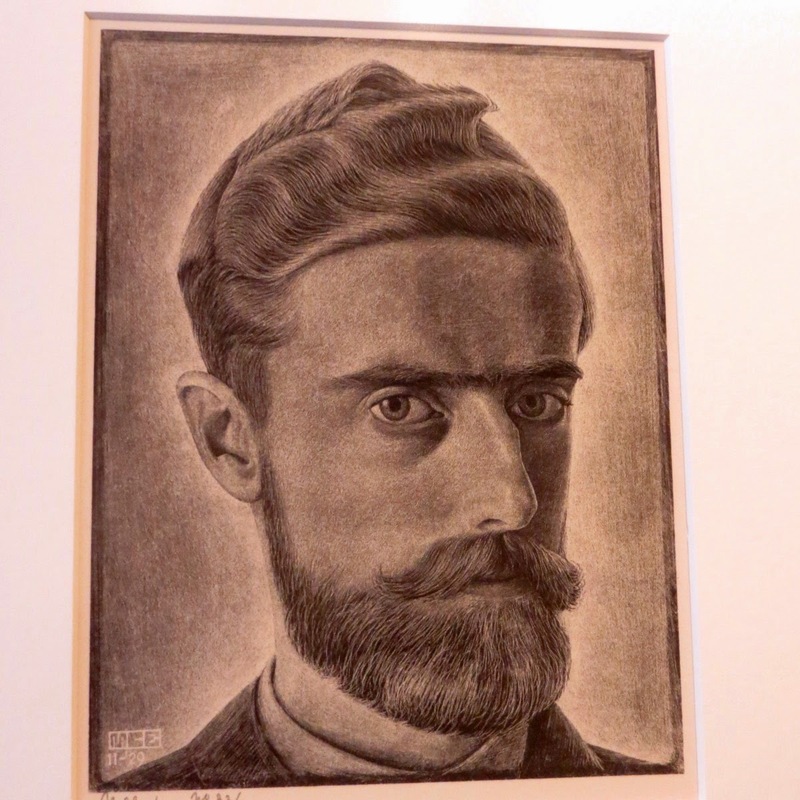 Reflection, eternity and infinity are common themes in Escher's work. 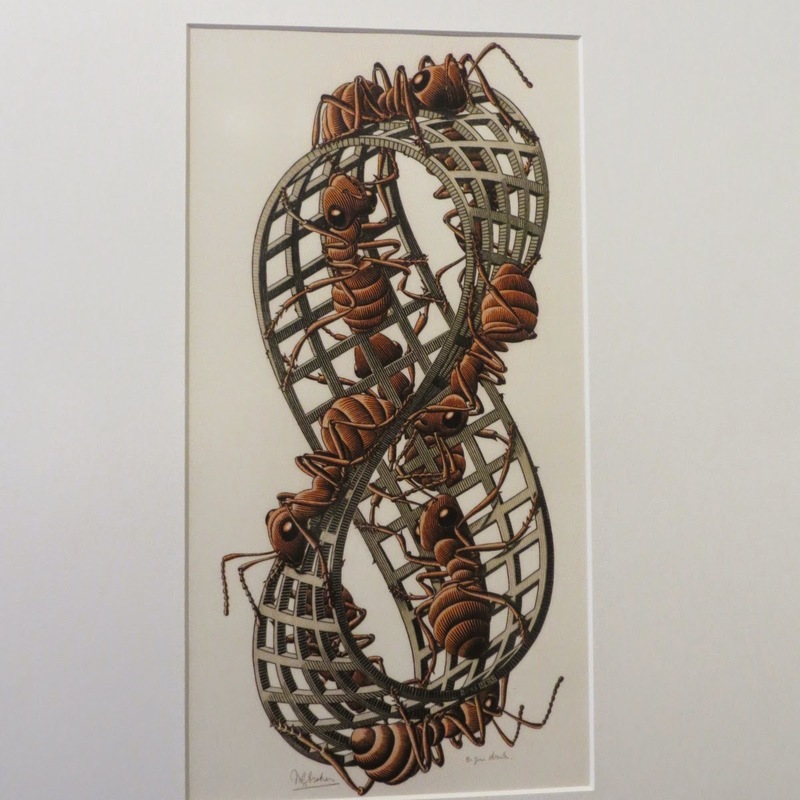 Escher did several etchings with a Mobius Strip theme. This one was weird! This last one was my favorite--a very sly optical illusion. Look at it closely--the two floors are at right angles to each other! The bottom floor is running left to right, and the top floor runs front to back-- which is, of course, impossible. But Escher makes it seem normal and logical! 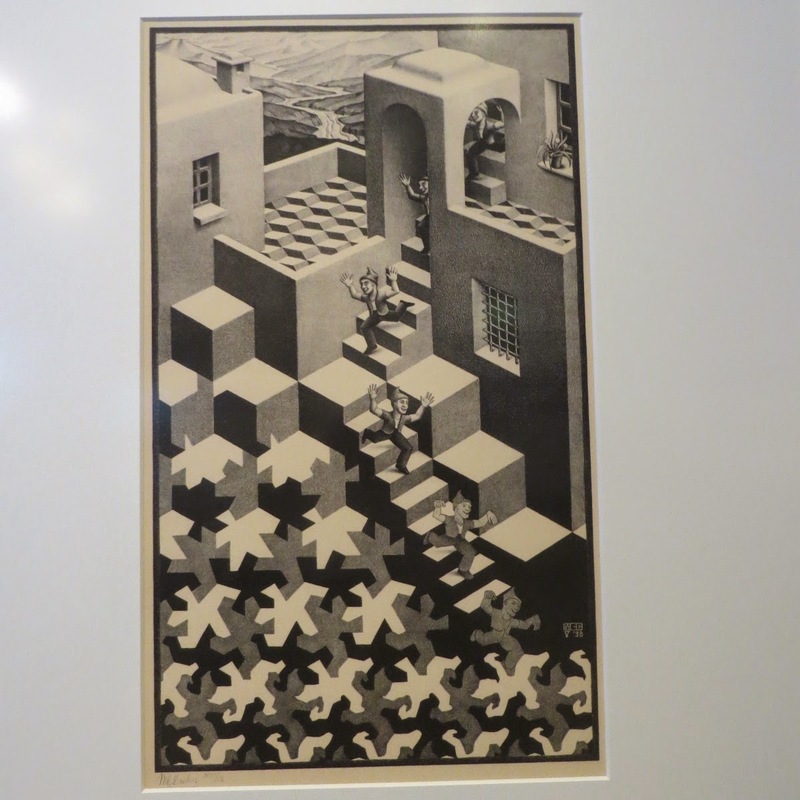 We took our time meandering through the two floors of Escher's work. I certainly wouldn't say that I understood it all--there were extensive explanations of math theories, tessalations, etc. that were way over my head! We both really enjoyed this museum, and wished Matt could have been there with us. MC Escher is one of his favorite artists. We took the stairs up to the third floor, and spent a bit of time playing with the optical illusion displays. They were pretty mind-boggling! After a couple of hours of Escher, our brains definitely needed a break before another museum visit! We walked a few blocks away and found a nice restaurant for a bite of lunch. We lucked out and picked a great spot, our lunch was delicious. We relaxed over lunch, enjoying a glass of wine each. 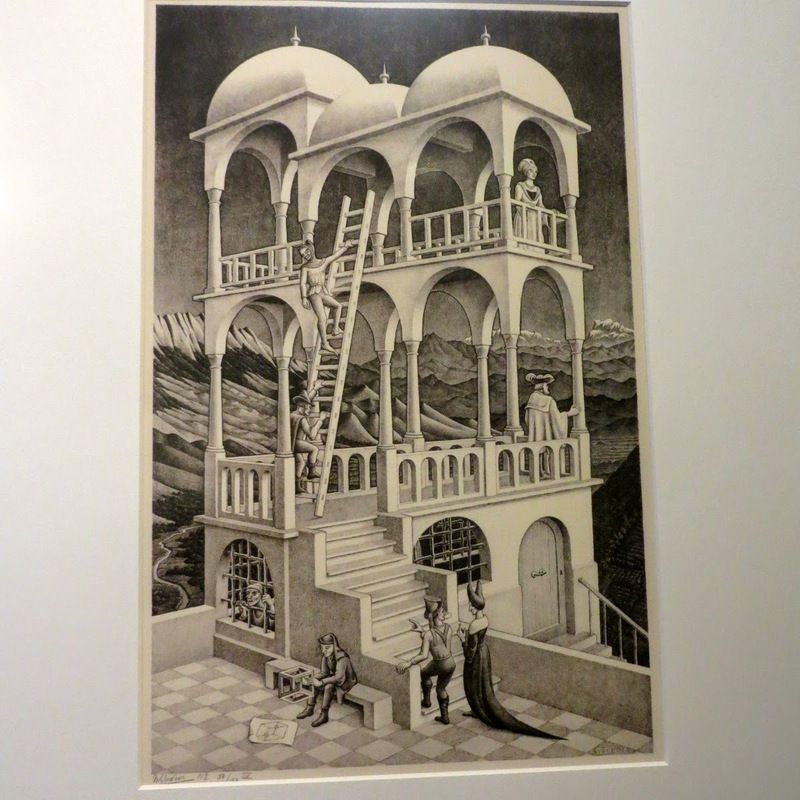 We were still on "sensory overload" from the Escher Museum. I felt like I needed to totally readjust my brain before we visited our next museum--The Maritshuis. Talk about one extreme to the other--from the strange and bizarre world of Escher to the fine art of the Dutch Masters! The Maritshuis was only a couple of blocks from the Escher museum, and we managed on our own without a tram ride! Not surprisingly, The Marithuis admission fee was a little steeper at 15E each--but it was well worth it. There were also many. many paintings by other Dutch Masters--Rembrandt, Van Gogh, Van Dyke, etc. We enjoyed them all, but didn't take many pictures. It was early evening by now, and we were both just worn out! We walked back to the station, where we lucked out again with a train waiting at the platform. We hopped on, relaxed for the 45 minute ride back to Amsterdam. David even snoozed a little! We agreed that we were too tired to cook dinner tonight, so we found a nice Indian restaurant on our walk back from the train station. We had a delicious dinner of Lamb Jaipur, lentils, rice and garlic naan. We shared a carafe of red wine, and that was just right--a perfect ending to a wonderful day! Tomorrow in Amsterdam: Market Day! I love the "Rippled Surface." I've never seen this picture before. I would love to visit this museum. How blessed you are. I'm a little behind on reading your blog but I love reading about your adventures. Today we finished both of M's houses - - - 1 1/2 months later! I'm celebrating tonight. We all will have many stories to tell. Miss you.